Free Coffee at Cumberland Farms for New Year’s! 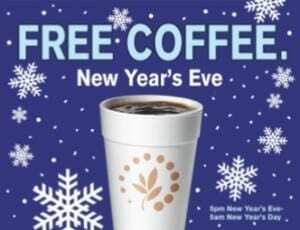 Starting at 5pm on Wednesday, December 31, 2014 Cumberland Farms will be offering FREE COFFEE to anyone who stops in after 5pm on NYE until 5am on New Year’s Day! For more information or to find a Cumberland Farms near you, please head here.